Prior to the advent of the Mersey Sound, Liverpool had been supplying artists in the popular music field for some time. When the official charts were launched in Britain in the 1950s it was to see hits by Liverpool artists such as Lita Roza, Michael Holliday and Frankie Vaughan. 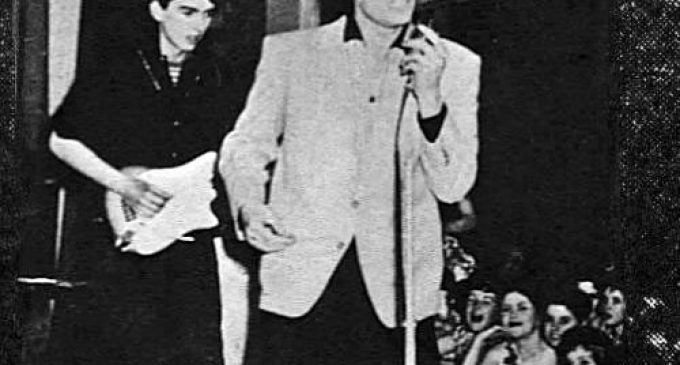 Impressario Larry Parnes was to sign three Merseyside singers – Billy Fury, Lance Fortune and Johnny Gentle. Parnes also appointed him a tour manager – another famous Scouser: Hal Carter. Johnny’s debut record was the self-penned ‘Wendy’, but it wasn’t successful. He followed with ‘Milk’, but it only managed to reach No. 28 in the charts. An EP ‘The Gentle Touch’ followed. In 1960 Parnes co-promoted an event with Liverpool coffee bar owner Allan Williams at Liverpool Stadium. Initially it was to have a bill topped by Eddie Cochran and Gene Vincent, but Cochran was killed in a road accident. With Vincent now topping the bill, Williams also featured local bands Cass & The Cassanovas, Rory Storm & the Hurricanes and Gerry & the Pacemakers. The event took place on 3 May and Parnes saw the potential of the Liverpool bands and thought it might be a good idea to use one of them as a backing band for Fury and find others to back Duffy Power and Johnny Gentle on tours. An audition was held at the Wyvern Club in Liverpool on 10 May which resulted in the Silver Beatles being selected to back Johnny on his Scottish tour. Their fee was £120, which was to include their fares from Liverpool. At the time the group comprised John Lennon, Paul McCartney, George Harrison, Stuart Sutcliffe and Tommy Moore. Gentle, then twenty years old, has been quoted as saying, “When I first saw them I wondered what on earth Parnes had sent me.” But he was later to deny he’d said this, claiming that he immediately liked their youth and enthusiasm. 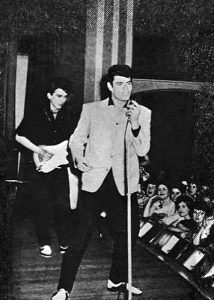 The tour began on 20 May 1960 at the Town Hall, Alloa, Clackmannashire. Other gigs were on 21 May at the Northern Meeting Ballroom, Church Street, Inverness; on 23 May at the Dalrymple Hall, Fraserburgh, Aberdeenshire; on 25 May at St Thomas’s Hall, Keith, Banffshire; on 26 May at the Town Hall, Forres, Morayshire; on 27 May at the Regal Ballroom, Leopold Street, Nairn, Nairnshire and on 28 May at the Rescue Hall, Peterhead, Aberdeenshire. The group name was never actually used in the promotion of the tour, as the billing read ‘Johnny Gentle and his group’. However, three members of the band decided to use stage names. Paul used the name Paul Ramon, George adopted the name Carl Harrison and Stuart called himself Stuart de Stael. It has been suggested that John called himself Johnny Silver, but he denied this. Johnny first met the group half an hour before they were due to go on stage together and they had time for only twenty minutes of rehearsals before their performance. The promoter, Duncan McKinnon wasn’t impressed with the show but Johnny explained that they needed rehearsal time together and, after practicing the next day, the stage show improved. McKinnon had also complained about their stage gear, so Johnny gave George a black shirt to wear, as Paul and John were wearing black shirts. It was the nearest they got to a uniform appearance on stage. Johnny had a room to himself and the Silver Beatles shared two rooms. Sometimes they were put in different hotels. Johnny recalled the best hotel they stayed in was in Inverness, overlooking the river. It was while they were at the hotel that he played a song he’d written called ‘I’ve Just Fallen For Someone’ to George and John. Gentle was having difficulty with the middle eight and John came up with something he’d written which fitted in. Johnny decided to use Lennon’s middle eight in his song and he actually recorded the number for Parlophone the following year under the name Darren Young. The record sold about 3,000 copies. “He also gave the tune to the middle. Gentle was to say that, despite their rawness as a group, he was impressed with them and urged his manager to sign them up. However, Parnes specialised in representing solo singers and wasn’t interested in the problems associated with managing bands. Gentle asked Parnes to book them again as his backing band, but they were appearing in Hamburg at the time. His singing career was unsuccessful, despite changing his name to Darren Young. He also joined vocal outfit the Viscounts for a time. He moved to Jersey for a while, but couldn’t maintain a living as a singer and in the early 1970s began his own joinery business. This proved to be very successful. Johnny married and became the father of two children, Gavin and Donna – and is now a grand-dad and lives in Kent. Happily ensconced in Kent, he had a brief return to the limelight when the ‘Beatles Anthology’ was released and the press became interested in that first Scottish tour. He also participated in the BBC radio show ‘The Beatles in Scotland’ and Merseyside rock historian Ian Forsyth then persuaded him to put his story down in print. The result was ‘Johnny Gentle & the Beatles: First Ever Tour’, published in 1998.